You need a Google profile. I’m imagining the look on your face and your reply, “What, another cyberspace diary that shares my inner-most thoughts with the world? No thanks!” I can understand the apprehension, though it’s not. If you are interested in reaching a broader audience for business sake, then you need to take advantage of another powerful Google tool. It’s a convenient [and smart] way to place all your many Web presences into a portal, of sorts. It’s an online business card for when people search for your name. Simply put, a Google profile is a public identity (*private information excluded) for all those social networking and business related Web sites that you want the public to know about. If you’re worried about how you are portrayed on the Web and want more control over what folks see when they search for your name, then your profile is your “brand”. 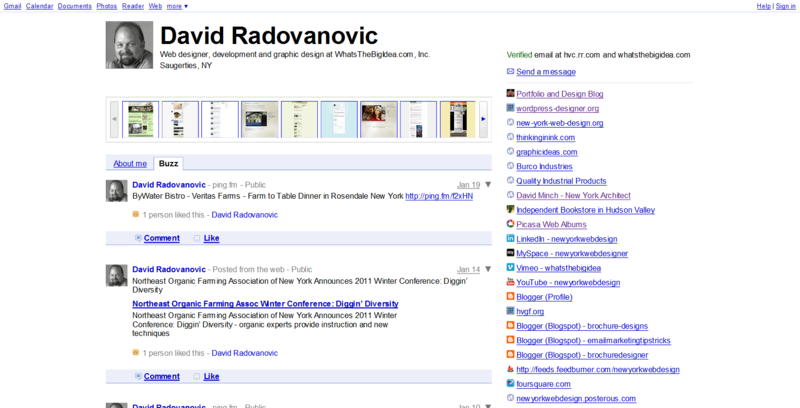 Once it is indexed, your profile will appear prominently when someone searches for you in Google. Buzz, Blogger, Picasa, Flickr, WordPress, Facebook, Twitter, MySpace, Scribd, LinkedIn and all the many other sites that you are involved in, can all be included into your profile. You can even add an image feed from your online images or portfolio, i.e. add Picasa, Flickr or your own custom feed. The emphasis of a profile is on Buzz, which is a cross between FaceBook and Twitter. However, you decide what is revealed, so inappropriate or off-topic “Reader” feeds can be deleted. Remember the ever-spinning rotary Rolodex? 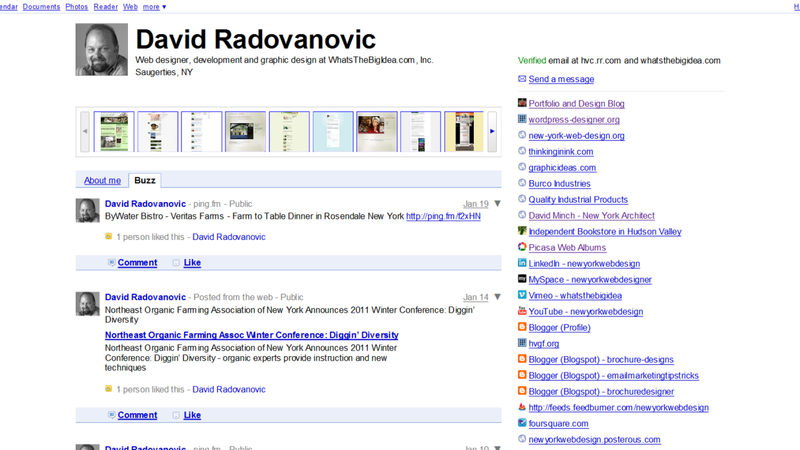 When you create a Google profile you are placing your digital calling card in the world’s largest Rolodex. As far as convenience is concerned, your profile (when logged in to your dashboard – https://www.google.com/dashboard/) seamlessly integrates other Google products so that it becomes an invaluable repository for your gmail accounts, Blogger, Google Talk , Tasks, Voice, Webmaster Tools, Analytics, Feed Burner, Docs, Calendar, Buzz and Alerts, just to name a few. All are available in one convenient location. If you’re a Web designer and SEO enthusiast like me, then having the full suite of Google products is a no-brainer. Regardless of your programming knowledge, if you have a product or service to offer the public, then it makes good business sense to get your Google profile soon. *You have full control over what others see. Your private information won’t display unless you’ve added it.